Welcome to the newly-enhanced Pacific Coast Architecture Database, PCAD version 4.0. This is a new version of the Pacific Coast Architecture database, developed over the summer and autumn of 2014. We have retroactively dubbed it "version 4.0" as it represents the fourth major stage in the technological evolution of PCAD. For more on PCAD's history, see the About page. This version introduces a number of enhancements and new features. A new layout and graphical look: PCAD was "re-skinned" with a modern, adaptive CSS framework. While still targeting desktop devices as the primary user, the site should function adequately on smaller screens. In the future we will work toward supporting all types of devices equally well. User-selectable UI themes: to try out this feature, select More > Display Options and choose a different theme. 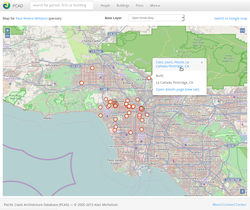 New mapping features: interactive maps of sites associated with an architect or firm. See PCAD 4.0 -- Mapping Features for more information.